I adored this book! As memoirs go – top, top notch – super interesting and engaging! The Milk Lady of Bangalore took me completely by surprise. I had no idea what this was going to be like and within the first few pages I was hooked. Narayan, a journalist by trade, writes in such a pleasing way. To me, it flows like you are sitting for coffee with a friend and she is telling you a very detailed story. I couldn’t put this one down and ended up reading it in three days. This is a memoir – one of the best I have EVER read – but it is truly so much more than that. The basic gist is that Narayan decides with her husband to move back to their native-India after living for 20-years in the United States. They both have parents who are getting older and as they have two children, they want their children to know their grandparents and experience their culture. They move into a large apartment building in Bangalore and on move in day, Narayan, by chance, meets Sarala, the milk lady. This is how it all begins. This book is a beautiful examination of culture, friendship, life, love, loss and growth. I laughed and I cried. You know you have found a special book when one brings out such a wide range of emotions – in my opinion anyway. It was interesting to read about Narayan really learning about her own culture for a second time. I could absolutely relate with a lot of her feelings having moved away from the area I grew up in, and being away for many years, going back, you see things with fresh eyes. You can appreciate how much culture varies from area to area and that can really bring forth a lot of self reflection about ones own beliefs, traditions, goals, wants, needs and really where one feels like they belong. In this book you will also learn so much about cows – magnificent animals, they really are. This book felt to me like a microhistory of cows and their role/significance in India culture, particularly through different Hindu beliefs and customs. I absolutely adored that aspect of the book. If you are someone who enjoys that type of book, you will love this. Also, if you are a foodie, you will probably love this and should definitely read it. There is a lot in here about milk, the different types / properties of milk. I am telling you, fascinating. Overall, I applaud Shoba Narayan for her efforts with this and I say, thank you, for sharing this part of your life with the world. It was beautiful! Also, a big thank you to the publisher, Algonquin Books, for providing me with a copy of this to read and review. I truly appreciate the opportunity and apologize that it has taken me so long to get to this! One of my favorite and most unique reads of 2018 so far! All the stars in the universe! As memoirs go, this is top-notch! If you like science, you need to read this book. 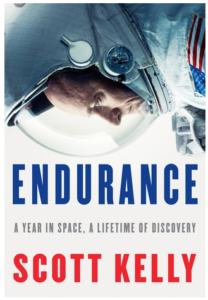 I listened to the audiobook, narrated by Scott Kelly himself, and was hooked from start to finish. For me personally, I find it very hard to critique a memoir. I mean, it is that person’s story, it is up to them how they choose to tell it. This being said, even if I was a better reviewer I would have a hard time finding anything to critique within this book. Detailing everything from his childhood, his navy pilot training and career, astronaut training and numerous space missions, this book is replete with interesting facts and stories. I didn’t want it to end – I flew through it and recommend it for everyone. Scott Kelly has lived one hell of a life and you should learn about it! Do you enjoy reading memoirs? If you do, what is one you would recommend to everyone? I want to know – comment here or send me a message – I would love to hear from you!